Volunteer gravedigger Harold Campbell, a veteran of two uranium mines, has been treated for prostate cancer. When there’s a funeral on the Spokane Indian Reservation, Harold Campbell puts on his grave-digging hat, collects his tools and heads to the cemetery. Over the past 30 years, the volunteer gravedigger has helped prepare the final resting spots for hundreds of the tribe’s members. Death is a familiar presence to Campbell, who sits with grieving families and blesses burial plots with the fragrant smoke of sage and sweetgrass. Yet one aspect troubles him: Too many Spokane Indians die from cancer. The radiation is from the Northwest’s only open-pit uranium mines – an all-but- forgotten chapter of Washington’s Cold War history. Uranium ore was blasted out of the Spokane Reservation’s arid hillsides and sold to the U.S. Atomic Energy Commission. The truckloads of radioactive material that rumbled daily through the reservation helped build the country’s nuclear weapons arsenal. The mines closed 30 years ago, but they’ve left a complex legacy of pride, patriotism and radioactive pollution on the 157,000-acre reservation west of Spokane. After uranium deposits were discovered in the 1950s, entire families drew paychecks from the mines. The work seemed part of a greater cause, a strike against communism. 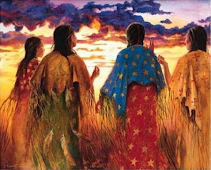 And it brought a flash of prosperity to the impoverished reservation through steady paychecks and mining royalties. But now there are troubling questions. Many workers labored without adequate safety gear. They brought home dust on their clothing, exposing their families to radiation and heavy metals. Uncovered ore trucks spilled radioactive rock, creating “hot spots” along the highway bisecting the reservation. With each new cancer diagnosis, people wonder: Is it from the radiation? It’s a haunting question. Bob Brisbois, the tribe’s executive director, lost five members of his extended family to cancer in a single year. Brisbois’ 40-year-old nephew had the same question. “He swam in the Spokane River below the mine,” Brisbois said. “He ate the roots and berries and wild game.” The nephew died last year of cancer that started in his bladder and spread throughout his body. An epidemiology study might provide some answers. The Spokane Tribe teamed up with the Washington Department of Health and the Northwest Indian Health Board to track cancer rates among the tribe’s 2,700 members. Study results are pending. Meanwhile, 33 million tons of radioactive waste rock and ore remain at the Midnite Mine site, the largest of the two uranium mines on the reservation. The Midnite Mine, now a Superfund site, has been closed since the early 1980s, when uranium prices plunged. Three years ago, a federal judge ordered one of the world’s largest mining conglomerates, Newmont Mining Corp., to pay its share of the $152 million in cleanup costs at the Midnite Mine. Yet little work has taken place on the ground. The forgotten aspect of the Spokane Tribe’s role in the Cold War troubles Deb Abrahamson, a tribal activist who formed the SHAWL Society to advocate for cleanup of radioactive waste. Billions of dollars have been spent on cleanup at the Hanford Nuclear Reservation, which regularly makes national news, she said. But Abrahamson said few people outside the Spokane Reservation know about the Midnite Mine, or that the radioactive legacy of the U.S.-Soviet arms race is still poisoning the tribe’s land and water. Without the Atomic Energy Commission’s involvement, the uranium mines wouldn’t have been built. It’s a tarnished end to a discovery that began with so much excitement. One night in 1954, twin brothers Jim and John LeBret were prospecting on the Spokane Reservation with a Geiger counter and mineral light. Shortly after midnight, their Geiger counter roared to life. On Spokane Mountain, they had discovered rocks with a fluorescent green glow. The brothers, members of the Spokane Tribe, staked the first uranium claim on the reservation. By the end of that year, the Midnite Mine shipped its first load of uranium ore to a Salt Lake City processing plant. It was the beginning of “uranium fever” on the reservation. Nationwide, thousands of prospectors hoped to strike it rich. The Atomic Energy Commission was offering lucrative contracts to jump-start a uranium industry in the United States. Domestic supplies were needed for the nation’s nuclear arsenal. The largest uranium deposits were discovered on the Colorado Plateau of the Southwest, including the Navajo Nation, where more than 1,000 mines were built. The Inland Northwest also got caught up in the excitement. “An atomic age of opportunity has dawned for the Spokane Indians,” decreed a Spokane Chronicle article. By the next spring, “dozens of Spokane people had purchased Geiger counters and spent the weekends trotting over the hills hunting new finds,” according to The Spokesman-Review. Uranium was worthless in the late 1800s when members of the tribe were moved from their homelands along the Spokane River to the reservation. By the 1950s, a 55-gallon barrel of uranium oxide was selling for $32,000. The LeBret brothers and their partners formed Midnite Mines Inc. They brought in Newmont Mining Corp. to create Dawn Mining, the entity that operated the mine. Newmont had a controlling interest in Dawn, and at one point, Dawn’s uranium sales contributed $1 million annually to Newmont’s dividends. Phelps Dodge opened a second uranium mine on the reservation, the Sherwood Mine, through its Western Nuclear subsidiary. In the early days, the U.S. government bought all the uranium ore through the Atomic Energy Commission. Later, uranium from the Spokane Reservation was sold to the energy industry for use in nuclear power plants. Uranium ore and radioactive autunite crystals became curiosity pieces and collector’s items. One Spokane stockbroker kept a large chunk of uranium ore in his display window, until the Atomic Energy Commission ordered it removed. Some thought the yellow-green crystals had medicinal value. Clyde Lynn’s grandmother kept a 6-inch-long crystal in a suitcase under her bed. She died of cervical cancer. For nearly three decades, uranium was a booming industry on the reservation. At its height, about 500 people drew paychecks from the mines and their ore-processing facilities. Connie LeBret was hired at the Midnite Mine in her 20s. After the dust settled from blasting in the open-pit mine, she’d head out on foot with a Geiger counter to measure the radioactivity of the pulverized rock. A front-end loader followed to scoop up the radioactive ore.
“At the time, we didn’t know it wasn’t ‘good stuff,’ ” interjected her husband, Tracy LeBret, a distant cousin of Jim and John LeBret who also worked at the mine. He thought the apple-green ore looked like kryptonite, the fictitious radioactive rock from Superman’s home planet. Most workers considered the ore benign. Managers reinforced that message, the couple said. Neither of them wore protective gear beyond hard hats, safety glasses and steel-toed boots. Aside from logging, uranium mining was the only steady work on the reservation, said Connie LeBret, whose father and brothers also worked in the industry. Some of the tribe’s elders have fond memories of the days of full employment, her husband said. Not him. Several years after Connie LeBret left the Midnite Mine, a red spot appeared on her knuckle. It was the first symptom of rheumatoid arthritis, an autoimmune disease that several of her siblings also developed. Symptoms include swollen knuckles, painful joints and difficulty walking. The cause of rheumatoid arthritis is unknown, but it is believed to have both hereditary and environmental contributors. Connie LeBret wonders if radiation or heavy metals played a role. LeBret’s younger brother, Randy Abrahamson, worked at both the Midnite and Sherwood mines. (He and his sister are distantly related to Deb Abrahamson, the tribal activist.) His former wife shook out his dusty work clothes before putting them in the wash.
Abrahamson, 51, is healthy, but he lost a daughter, 8-year-old Rachel, to a brain tumor. Eighteen months ago, his youngest son, Dillon, was also diagnosed with a brain tumor. Dillon, now 9, had surgery to remove part of the tumor. He started treatment again this spring to shrink the remaining mass, which had begun growing again, said Rebecca Witty, Dillon’s mother and Abrahamson’s second wife. “We pray every day,” said Abrahamson, who wonders if the tumors are related to his past work at the mines. “I wish we’d had more knowledge and had taken preventive action,” he said. “We could have worn jumpsuits and protection. We could have showered before going home to our families. Clyde Lynn, 81, spent most of his career as a teacher and a counselor. But in 1981, when he was out of work, Lynn took an employee benefits job with Western Nuclear, the Phelps Dodge subsidiary that ran the Sherwood Mine. He was grateful for the paycheck. But the safety lapses he observed appall him now. Uranium was part of daily life on the reservation. People in their 40s recall watching ore trucks rumble past as they waited for the school bus. Campbell, the gravedigger, spent his early years in Uranium City, a collection of houses and trailers that sprung up down the road from Dawn Mining’s Ford mill site, where the ore was processed. As a kid, he played in the dust under the haul trucks. His dad, a millwright, collected ore samples for Campbell and his older brother. Campbell later worked as a truck driver at the Midnite Mine and in the mill operation at the Sherwood Mine. Altogether, he spent about four years in the uranium industry. John Mudge, Dawn Mining’s vice president, disputes that working conditions were unsafe. Mudge worked on the Spokane Reservation from 1980 to 1982. He said Midnite Mine employees and millworkers wore dosimeter badges to track radiation exposure. Workers handling yellowcake in the mill wore respirators, Mudge said. Once a month, the badges were sent away to a lab for analysis. “The radiation doses were very low,” he said. Taking a tour of the Midnite Mine requires entry through a locked gate surrounded by an 8-foot-high fence. The fence was installed in 2009 as a safety measure to keep people out of the 320-acre mine site, said Randy Connolly, the Spokane Tribe’s Superfund coordinator. The federal government recommends spending no more than one hour a day at the mine site to limit exposure to radiation and radon gas. People shouldn’t eat berries or plants gathered from the Blue Creek drainage where the mine is located, or fish from the creek, according to the Agency for Toxic Substances and Disease Registry. Meat from deer and elk that forage in the drainage could also pose health risks, the study said. But for years after the Midnite Mine closed, the site remained accessible. People hauled truckloads of gravel out of the mine for driveways and construction projects. Unbeknownst to many, they were hauling away “proto-ore,” lower-grade radioactive ore that was stockpiled in the event that uranium prices rose, Connolly said. Radioactive rocks embedded with crystals were also hauled away. They turned up in rustic rock fireplaces and decorative landscaping. Lush grass and multiple water sources attracted elk, which established calving grounds at the Midnite Mine. Before the elk were fenced out, Connolly said, it was common to see dozens of cow elk and calves on the hillsides. The salts that leached out of piles of radioactive mine waste attracted other wildlife as well. Nearly 3 million tons of uranium ore were blasted out of these hillsides. Visitors can stand at the top of Pit No. 3 and look down 500 feet to the bottom, which is covered with sparkling turquoise water. The pit’s milky, blue-green coloring is reminiscent of Lake Louise in the Canadian Rockies or travel brochures for the Bahamas. But the water is far from pristine. Sludge at the bottom is high in radioactivity and heavy metals. South of the Midnite Mine, a series of earthen terraces is visible on the horizon. That’s the reclaimed Sherwood Mine, which the Nuclear Regulatory Commission cites as a model for mine cleanup. The Midnite Mine’s cleanup lags behind its neighbor as the result of long-running litigation over who will pay the $152 million bill, which includes at least 140 years of water treatment. Dawn Mining is broke. Company officials are borrowing money from Newmont to pay the bills. During the lawsuit, Newmont tried to avoid responsibility for cleanup costs by saying it had little to do with the Midnite Mine’s day-to-day operations. In 2008, U.S. District Judge Justin Quackenbush ruled that the cleanup costs should be split evenly among Dawn, Newmont and the U.S. government. If Dawn can’t pay, Newmont is responsible for its share, too. In his ruling, Quackenbush said the government is partly responsible for the mess, because it didn’t fulfill federal trust responsibilities to the Spokane Tribe through proper oversight of the mine. Settlement talks are under way, with a signed agreement possible later this year. That would kick off a two-year design phase for the cleanup. 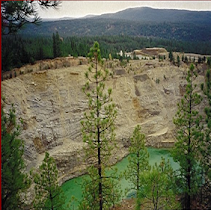 The Midnite Mine site needs extensive remediation, according to the U.S. Environmental Protection Agency, which crafted the plan. Two open pits remain at the mine. Five other pits were filled in with “really nasty stuff” that’s polluting the groundwater, Connolly said. Towering waste rock piles litter the mine site. The haul roads were built with radioactive gravel. Under orders from the federal government, Dawn Mining collects and treats water from the site before pumping it into Blue Creek, a tributary of the Spokane River. The treatment removes radioactive materials and heavy metals. But the tribe’s monitoring indicates that pollution levels are still high enough to kill aquatic insects in Blue Creek, Connolly said. The tribe wants the water pumped directly into the Spokane River, where the pollution would be diluted in the larger water body. Tribal officials also want a small plane equipped with radiation-sensing equipment to fly over the reservation. It would help detect radioactive driveways, so they could be cleaned up, too. Did people get sick from uranium mining on the Spokane Reservation? The answer is elusive. Multiple factors contribute to cancer risks, including smoking, genetics, diet and lifestyle. Nationwide, cancer is the second-leading cause of death among American Indians and Alaska Natives over 45. Yet the Midnite Mine site poses serious health risks. The EPA ran models, assessing how people’s cancer risk would increase if they lived at the Midnite Mine for 70 years, or gathered plants, hunted game and drank surface water from the site as part of a subsistence lifestyle. Some numbers in the hypothetical examples are “eye-popping,” said Elly Hale, an EPA project manager working on the Midnite Mine cleanup. An individual who lived off the land at the mine site, for example, would have a 1 in 5 probability of getting cancer, according to the modeling. The model was based on 70 years of exposure to pre-cleanup conditions. Some of the risk also came from background radiation in the highly mineralized area, Hale said. However, the modeling only looks at current risk. It doesn’t try to approximate the risk former workers faced, or how much radiation or heavy metals their families were exposed to from dust that came home on their clothes. Decades of studies done on the Navajo uranium workers in the Southwest show elevated rates of lung cancer and kidney disease. Occupational health protections for workers didn’t take hold until the 1970s. Yet as early as 1950, the U.S. Public Health Service was studying illness rates in uranium miners. The results, published in 1962, showed the first statistical correlation between cancer and uranium mining. Before the mines opened, Navajos had one of the lowest cancer rates in the nation, said Chris Shuey, an environmental health specialist with the nonprofit Southwest Research and Information Center in Albuquerque, N.M. In addition to workers, cancer rates shot up in the general population, he said. Further studies have focused on gallbladder, stomach and kidney cancers, as well as breast and ovarian cancers. “We’ve got pretty good evidence that the closer you live to mine sites, the sicker you are,” Shuey said. A new study on the Navajo Reservation will track whether unborn babies are at risk from uranium exposure. Concrete used to build houses on the reservation contained radioactive sand and rock. In addition, people can be exposed by drinking water from contaminated sites or eating meat from animals that grazed there, said Steve Dearwent, chief of the federal Agency for Toxic Substances and Disease Registry’s health investigations branch. The study will follow expectant mothers to determine if uranium exposure correlates to low birth weights, premature births or more serious birth defects. Educating women so they can reduce their exposure is part of the study. The Spokane Tribe occasionally gets inquiries about restarting the Midnite Mine, which has about 7 million pounds of ore left. Higher uranium prices are driving the interest. The U.S. imports 90 percent of the uranium used in its nuclear power plants. But tribal Councilman Rudy Peone says it’s unlikely the mine will ever reopen. In the 1990s, Peone said the tribal council made a policy determination that human health and the environment were more important than mining royalties. “To this day, we don’t know all the negative impacts of what that mine did to the land, the animals and the people,” he said. Tribal activist Deb Abrahamson’s focus is gradually shifting. Instead of lobbying for cleanup, she’s starting to work on safety for future cleanup workers. Through the lure of paychecks and steady employment, the cleanup will have parallels to the original uranium rush. “Those jobs are going to look very lucrative to this generation,” Abrahamson said. This time around, she wants to ensure that workers have proper protective gear and know the risks. Otherwise, another generation could be exposed to radiation, Abrahamson said. Last winter, Harold Campbell had to take a hiatus from digging graves. He was at Loma Linda University Medical Center in California getting treatment for prostate cancer. One of Campbell’s desk drawers is stuffed full of funeral bulletins.